*Using only the finest freshly ground coffee beans. *100 % Crushed Fruit Smoothies with no artificial flavors, sweeteners or colors. *Giving back to the local community through involvement in various charity organizations. 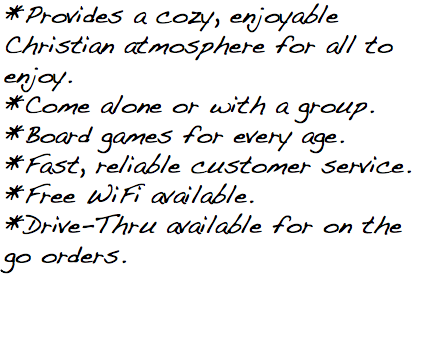 *Providing a cozy, enjoyable Christian atmosphere for all to enjoy.